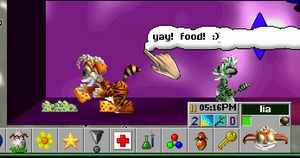 Edynn is a project attempting to design an essentially new Creatures game built on top of the Docking Station engine, created and programmed almost entirely by Chani (incubator and teleporter graphics were donated by Data). Though it has seen little development of late, it currently exists in a usable state. Parts of Edynn may be adapted for future use in Lifandi. You can download Edynn from archive.org here. Edynn is desparately seeking some decent spriters. If you are willing to draw some decent graphics (use the current ones as vague guides -- nothing more than that! ), then please contact either Chani or Nornagon. Thanks! zareb is currently making a background for one of the metarooms. Mostly complete GUI (buttons, etc). The current version of Edynn, Build 8, can be downloaded at Caisleáin Uaine (archive). There are both Windows and Linux versions available. Edynn seems to have serious problems with Creatures Exodus. The darn thing seems to have changed all sorts of weird little things, Chani doesn't know what they are, and doesn't have the patience to try fixing them, especially since she doesn't have windows *or* exodus. She suggests using the free download instead, or using Linux where everything is much more happy. When you try to copy an edynn world into ds, DS will think edynn is Creatures 3. I don't have Creatures 3 so I couldn't open it. Impish. This page was last modified on 11 July 2017, at 00:38.